Things that make you say WOW! 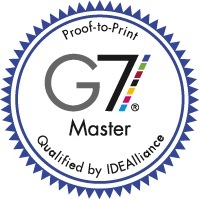 Since 2009, West Press has maintained its Master G7 certification from IDEAlliance making it the only printer in Southern Arizona and one of 1,057 (out of more than 35,000 commercial printing companies) nationwide to achieve this goal. This program certifies that West Press has been trained to implement the new G7 Proof-to-Print process and recognizes that we use the most modern technology and techniques as well as process controls and standards required to produce high-quality commercial printing available today. What it means for you, the customer. Customers benefit from our G7 certification because they’re getting the very best color management available today. The G7 process will provide you, the customer, with 100 percent verifiable accuracy of color reproduction throughout the entire workflow—from digital image to final printed press sheet. Basically, it means you get a product that has been run with tighter process and quality controls than those using a pressman’s eye for color. We have invested time and money to calibrate our equipment and to train our team on providing you with the highest quality printed product. Being a G7 Master Printer means that West Press has another tool to use for providing you with a top-notch product at no additional cost.